Wymore from the very start was a city of law and order and was made up of people who were, on the whole, God fearing, freedom loving and law abiding, as is attested to by the number of churches that were embraced by her citizenery, and over the past seventy-five years has maintained a strong moral fiber of which we can all be justifiably proud. of childhood on up, fond rememberances of our "Home Town." We only wish that we could convey some of the happiness of living moments of marriages and christenings, or the sadness for departed ones that are held within the walls of our beloved houses of God. If only those walls could speak, what sermons they could give us from out of the past. Histories of the churches, as prepared by their own members will be found on following pages. The history of St. Mary's Catholic Church of Wymore begins with the founding of Wymore itself as some of the first settlers were Catholics. Rev. A. C. Rausch of Table Rock and Tecumseh said the first Mass in Wymore in 1881. Masses were said in private homes until the Spring of 1882. At that time, Rev. Rausch purchased three lots at the cost of $225. He erected a two-story house at his own personal expense, using the ground floor for a chapel. This house is nown [sic] known as the Deering Apartments and is located diagonally across from the present church. The congregation grew rapidly and at the close of the year 1885, a subscription was taken up to erect a church. The corner lot adjoining the lot on which the house was erected was donated by Captain Ashby and a frame church was built and dedicated in the fall of 1886. In 1883, John G. Paul donated five acres of land located adjacent to the Burlington right-of-way, about a mile and a half northwest of Blue Springs, to be used for a cemetery. Later, the present cemetery location was acquired. At the retirement of Rev. A. C. Rausch, April 3, 1889, his house was purchased at a cost of $1800, $400 of which was paid off at once. ber 18th of the same year. It was completed at a cost of $14,000, building and furniture included. In the spring of 1894, the old frame church was torn down and the lumber used in the erection of a large two-story pastoral residence. This was completed October 11, 1894, at an estimated cost of $2,200. The old church property was sold at a sum of $1150, and the balance of the original debt to Rev. Rausch paid off. The entire property, at this time, including the block, house and church, cost the congregation approximately $17,700. Rev. J. C. Freeman died November, 1915, after serving the parish for 26 years and is buried in Calvary Cemetery of Wymore. In 1940, the interior of the church was completely remodeled, the Rt. Rev. Msgr. Wagner being pastor at the time. Extensive repairs were made in 1954, on the exterior of the church under the supervision of Father Thomas Daly. New sidewalks were laid and an electric bell system was installed in the church. The same year, new lighting systems were installed in both the church and rectory. Among other improvements in recent years was an electric organ. Priests serving the parish have been Rev, A. C. Rausch, Rev. J. C. Freeman, Rev. D. Cronin, Rev. John Hennessy, Rev. Joseph Keany, Rt. Rev. Msgr. D. B. O'Conner, Rev. J. R. Sinkula, Rt. Rev. Msgr. S. J. Wagner, Rev. Richard Brombach, and the present pastor, Rev. Thomas Daly. The history ot the Wymore Christian Church goes back to 1886 and '87, when a few devoted Christians met with Mr. Bearer, an elder of the Christian Church at Tecumseh, and organized the first meeting of the Church. Among the charter mem bers were Mrs. Butcher, Dicka Lytle, Ellis Snuffin, Mrs. Lottie Brooks and Philip Shoff. M. T. and Sarah Glenn and Lewis Brought were also active in the establishing of the Church. Among the first church officials were I. W. Bridenthal, E. V. Strobridge and Mont Blair. One of the early ministers at this time was C, B. Lockspeich, who ministered here in 1 888. Services were held in the beginning in an upstairs room of Bromwell Hall. The Sunday School was quickly organized, and the little room soon became the scene of much activity. A small building was built on the corner of the present church location ot 12th & E. This was quickly outgrown, and it was replaced in 1895 and '96, with the main part of the present structure. The first big evangelistic meetings were held in 1 896 by the minister, Harry Wilhite, who brought 72 new mem bers into the church at that time. Another successful meeting was held during these years by Harry Lem mon. By 1911, the membership had reached 115. Minister Charles Cobbey held a few meetings during this period, and the Christian Church soon attained a place of prominence of leadership in the community. worth and Schroder. Some familiar names among church workers of this period are Ida McKeever, Lizzy Haynes, W. J. Buckingham, Ryle, R. C. Brooks and Mrs. Mavis. Ida McKeever and Lizzie Hanes were especially active in reorganizing the church and renewing the preaching services, which had been halted for ap proximately five years near the turn of the century. Lizzie Haynes was church clerk for a number of these years. Some of the Board members in 1904 were Milt Glenn, George and Mary Snuff in and Oliver Wymore. The church burned its mortgage about 1 912, and during the ministry of E. R. Childs, 1913-5, the basement was put under the main part of the building. Other ministers followed Mr. Childs, and we note such names as Gardner, Lomax, Rethmeier (1909),Otis McClery, Hewitt, Bailey (1918), Alonzo Knight, Godell, E. M. Pardee, Harry Parsons, Lucy Edwards, Peter Coper, Mark Linscott, Marc Witzen burg, E. E. Powell, Craven Schraeder, L. W. Myers ond Kenneth Hoschouer. no doubt owes this fact at least in part to the Evangelistic Meetings, which have always been a part of the church's program. One of the best attended meetings in the church's history was held by minister Forsyth. A meeting was held with W. S. Lowe in 1928 or 29, resulting in 58 additions. Raymond Alber held a meeting in 1943 that brought in 53 new members. In the spring of 1942, the church was equipped with new church furniture, and a Hammond electric organ. The basement of the main part was remodeled in 1943. A parsonage was purchased in the fall of 1944. Roland Crellin ministered to the church from April of 1945 to September of 1946. During Mr. Creflin's ministry, the church observed its 50th anniversary. However, in working out a history for the occasion, it was discovered that the 50th anniversary should have been observed nine years sooner. This was again overlooked, when the cornerstone in the newest addition of the church was made. It gives the year 1 895, rather than 1886, as it should be. The '95 date is the year the main part of the church building was erected. Kenneth Hoschouer was called to a second term of ministry in September of 1946, which ministry he closed' the first of June 1956, having served a total of twelve years in all. In 1947, an addition was built to the church building, which housed a new baptistry, six class rooms and rest rooms. Dedicated in 1951 was a second addition, which added six more rooms, three of which are 'used as overflow for the auditorium. At the same time, the exterior of the church was also changed to what it is today. Landscaping was done, and the corner of 12th & E Streets in Wymore, where the physical building of the Church of Christ stands, took its place as one of the most attractive corners in town. During the total ministry of Mr. Hoschouer, nearly 400 persons were received into the fellowship of the congregation. Of these, over 200 no longer live in Wymore, or have passed away. Membership of the church now stands at around 400, with an average morning Bible School attendance of more than 250. All other services, including regular Lord's Day eve ning worship, are equally well attended. Three youth groups meet regularly, with an average attendance of between 70 and 80.
year include Joe Chapman, Cal Parmenter, Floyd Philippi, E. Z. Philippi, Toby Bryson, James Keck, Gene Oliver, Clarence Chaplin and Virgil Marshall. The congregation is completely debt free, and is enjoying the most prosperous years of its existence, financially; even though it does not take pledges from its members, has no financial drives, nor other plans whereby to raise its budget. Last year its local operating expenses amounted to more than $13,000, with some $4,000 sent to missions throughout the world. The Hoschouers closed their ministry on the 28th of May, this year. The new minister, Eugene K. Wilson, began service with the church on July 1. During the month of June, the Harold Dunson family, missionaries in the Kiamichi Mountains of Oklahoma, supplied an interim ministry. In the year 1882 there came to Wymore a man by the name of the Rev. Mr. J. W. Dobb. He was a Methodist minister, and, like many of that day, did not remain long. But one can surmise that it was not too long, for there were two other Methodist ministers who, according to the best and most re liable sources of such information, also spent some time in Wymore that same year, the Rev. Mr. J. C. Hobb, and the Rev. Mr. C. M. Hallopeter. These men both had a share in bringing the influence of Methodism to Wymore. However, the Rev. Mr. Hallopeter's term of service extended into the year 1883. During his term of service the organization of the church was completed and the Articles of Incorporation were filed as of July 25, 1883. Following Mr. Hallopeter's departure in 1883, the Rev. Mr. C. E. Dudleigh was appointed to the charge for a short time. The first Ladies' Aid Saciety was formed during his pastorate with Mrs. C. E. Dudleigh as its first President. Succeeding the Rev. Mr. Dudleigh, came the Rev. Mr. P. C. Ruckman, and his pastorate extended into the year 1 884. The records show that at that time there were recorded some sixty members. He was able to secure subscriptions toward a church building to the amount of $1 100. 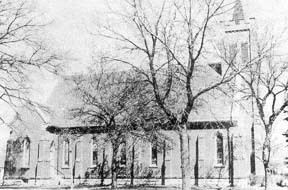 During the early years of 1883-84 the services were held in what was then the Congregational Church, now the Lutheran Church. From 1884-1885 services were held in the Bromwell Hall, and during 1885-86 in Livsey's Opera House. In the year 1886, the Rev. Mr. George W. Abbott was appointed to be the pastor. He was the pastor of this church from the fall of 1886 to the fall of 1 890. It was in his pastorate that the first church building of the Methodists in Wymore was erected. This came about in much the same fashion as did many another church in those early years, namely, through the determination and sacrifices of some inspired soul, and in this case it was Mrs. Wilhelmina Winter. The large stained glass east window in the present church is a Memorial Window in her honor. It came about in this manner. In the fall of the year 1885 she planned a big family gathering and pre pared a delicious dinner. After dinner she required of each one some contribution toward the building of a new church. She secured about $100 that day, and' then went out after more, with the result that on May 29, 1 886, the lot on which the present church now stands was purchased for the sum of $700. She continued her efforts, and with the help of others raised enough money to start the building project. The building was built at a cost of some $8200, but was left with a troublesome mortgage. The after effects of this unpaid balance were manifest when in the report of a pastor a few years later, he said, he "found the church heavily in debt, the members despondent, and the outlook gloomy." But with true pioneer courage they carried' on. In the year 1895 a total crop failure did not improve the situation. During the years 1896-98 the Rev. Mr. A. B. Whitmer was appointed as pastor and some $2500 was paid on the indebtedness and a new organ was purchased. Following the Rev. Mr. Whitmer came the Rev. Mr. J. R. Woodcock, and during his pastorate the church paid another $1000 on the debt, and collected subscriptions to the amount of $1600 additional to apply on it. As a result of the labors and perseverance of his two predecessors, the Rev. Mr.
J. W. Swan, who was appointed to the church in the fall of 1900, was able to pay off the remainder of the debt in a "mortgage-burning" ceremony at mid night, December 31, 1900. This building had been dedicated by Bishop Joyce on February 6, 1889, and to have it finally cleared of indebtedness by New Year's Day in 1 901 was indeed a cause for rejoicing. In the fall of 1901, the Rev. Mr. L. G. Parker was appointed as pastor and continued until the fall of the year 1905. The church grew in membership to the number of 217 members, and a new Parsonage was built. During his pastorate the Wymore church entertained the Annual Conference in 1902 with Bishop Fowler presiding. With the exception of the purchase of a church bell by the Epworth League in 1906, which is still in use, nothing unusual happened in the history of the church until in 1910. It was at that time that the church decided to build a basement under the super-structure and give the church a new coat of brick veneer to replace the old one. However, upon closer examination it was found that the floor joists had rotted so badly and the brick veneer was so deteriorated that it would be too expensive to attempt any such repairs. A meeting of the members was called, and it was decided to build a new church, and the new foundation was be gun on March 1, 1910. The new church building was dedicated by Bishop Neulsen on August 7, 1910. On Dedication Day the sum of $8300 was raised to complete the task of paying for the building, the cost of which was approximately $20,000. The Rev. Mr. E. F. Gates was the pastor during this time, serving the church from 1908 to 1912. 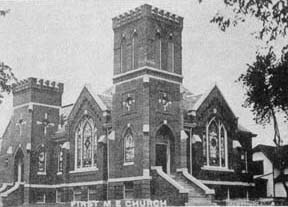 During the time of the construction of the new church, the services were held in the Taylor Opera House which was destroyed by fire during that time, and the church lost all of its records and hymnals which were stored there. In 1914, under the leadership of the Rev. Mr. F. D. Winslow, who was then pastor, the church built anew Parsonage which is still in use, and has served successive pastors well during the intervening years. In the year, 1929, during the pastorate of the Rev. Mr. R. A. Trowbridge, the church purchased and in stalled a pipe organ which had been in use by the Centenary Church of Beatrice until that time, Mr. John Dawson making a contribution of $500 in memory of his wife. This same organ is still in use under the capable hands of Mrs. Clella Lasher who has been organist for this church for 48 years and plans to round out a half century of such service. In April, 1949, under the leadership of the Rev. Mr. Delbert J. Sampson, the church was merged with the former congregation of the Blue Springs Methodist Church which had burned a few years before. With the insurance money which the Blue Springs people had, as a nucleus, the congregation staged a drive for additional funds by means of which some extensive remodelling and repairing was done. The cost of all of this was approximately $12,000. The present membership of this church is some 450 members, with a fine Church School, a very active and effective Woman's Society of Christian Service, a good Choir, a fine Methodist Youth Fellowship, a Men's Brotherhood, a growing determination to do worthwhile things, and a great challenge to keep 'growing spiritually' in the future. 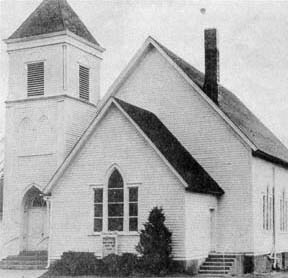 The first Episcopal church service held in Wymore was in the fall of 1881 in the Honeyman school house with the Rev. T. O. O'Connell officiating. On March 20, 1884, a service was held by the Rev. C. L. Fulforth of Beatrice at which time a petition was drawn requesting the standing committee of the diocese to establish a parish in Wymore. The petition was signed by eighteen persons, eight of whom were communicants of the church. The request was granted and on August 17, 1884, the parish was organized under the name of Saint Luke. Richard Whitten was the first Senior Warden; Mrs. C. L. Taylor, the first Junior Warden. The Rev. C. L. Fulforth came down from Beatrice for services. Bishop Worthington made his first visitation to Wymore on March 23, 1885, and preached in the Congregational church. On his second visitation Sept. 13, 1885, he officiated at the first Holy Communion service in Wymore which was held in the Opera House. Rev. S. A. Potter, deacon-in-charge, was elevated to priesthood. The church was consecrated April 15, 1890, with Bishop Worthington presiding. The church building cost about $2500 and the site was given by the Lincoln Land Company. A rectory and parish house were later erected on adjoining lots. The parish house was razed in 1941. In 1947 an undercroft was completed. The Rev. W. A. Cross, rector of the Church of the Holy Trinity, Lincoln, has been in charge of services at St. Luke's for the past two years. On June 1 st Mr. Richard Koch assumed the charges of the Wymore, Fairbury and Hebron churches. 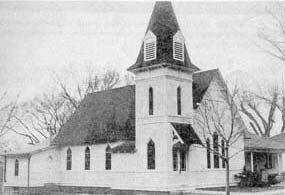 In 1936 Pastor Timken of Beatrice made a canvass of the Wymore community to see if a Lutheran Church might be started. When the canvass suggested a trial, he started preaching services in the rented Baptist Church. 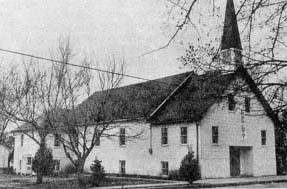 The congregation was organized on May 31, 1936 in the Kohlmeyer Hatchery with Pastor Timken presiding at the meeting. Mr. Herman Schmieding of Beatrice served as secretary. Six laymen were present: John Agena, Louis Gade, August Luebken, William Baumfalk, Ivan Kohlmeyer, and William Stein. Of these six charter members, two are still with the congregation. A call for a pastor was sent to the Southern Nebraska District president, who forwarded it to Concordia Seminary in St. Louis, Missouri. The first resident pastor to serve the congregation was Rev. Rudolph Scheffel, who was installed September 6, 1936 by Rev. Timken. During the first four years the congregation rented the Baptist Church for worship. This building was purchased March 10, 1940, and dedicated June 2 of the same year. The parsonage at 14th and "D" streets was purchased in 1937. Mr. Schmieding started the Sunday school at the first service with one pupil. During the 20 years of the congregation the Sunday school has continued, showing a fine growth, along with a Saturday school, a vacation Bible school, a Walther League, a Ladies Aid and Lutheran Womens Missionary League, and on adult Bible class as the educational program of the church. In 1939 the congregation resolved to join the Lutheran Church&mdash;Missouri Synod. Mr. Louis Gade signed synod's constitution for the congregation. At the time of organization the congregation numbered 23 communicant members. The membership today numbers 300 souls. NuWood and the basement of the church have been changed into a fine church parlor and assembly room together with a modern kitchen. In 1954 the Closs home was purchased for a parsonage near to the church and the parsonage at 14th and "D" sold. Pastor Scheffel accepted a call away from the congregation in June 1945. Pastor Timken again served the congregation until Chaplain Leonard Heidemann was first temporarily engaged to serve the congregation. In 1946 he became the permanent pastor and served the congregation until June 7, 1948 when he followed a call to Garner, Iowa. Pastor Armin Gottberg of Odell served the congregation as vacancy pastor until July 4, 1948 when Rev. Walter H. Landgraf, the present pastor was installed as permanent pastor. As in the present booming growth of new communities, Wymore, too, soon had the problem of providing educational facilities for her increasing number of children. Then, as now, the matter of transportation had a very important bearing on the school's location. 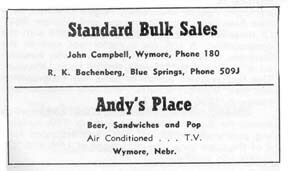 In the original organization of school districts, Wymore was included in the Blue Springs school district. The convenience of school buses was yet unknown, and there was no type of regular transportation between Wymore and Blue Springs. For this reason and as a matter of civic pride, the enterprising people of Wymore determined to form their own school district and to build their own schools. 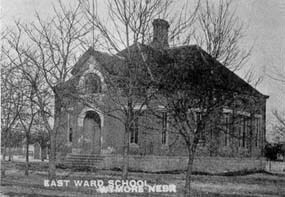 The East Ward school house for grade students was closed soon after the new building was built in 1925. It is now owned by the American Legion Post. rented at once and lessons started. As soon as possible a temporary building was built (later to be used as a church), and teachers were employed. 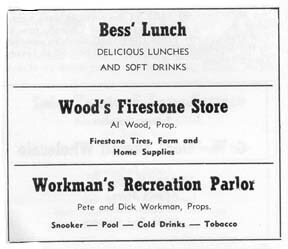 In the fall of 1881, a subscription school was started in Wymore. (Miss Sadie Hemperley of this city reports it was held in a business house on West D street, across the street from the Chet McPheron residence.) This proved too small and another room was secured. A census taken March 17, 1882 showed Wymore to have 224 families, numbering 1,280 in habitants, of which 375 were of school age. That same month the schools were detached from the Blue Springs school district, erected into a separate school district and numbered 114.